Just to give you a bit of an update, New York Fashion Week has been flying by! 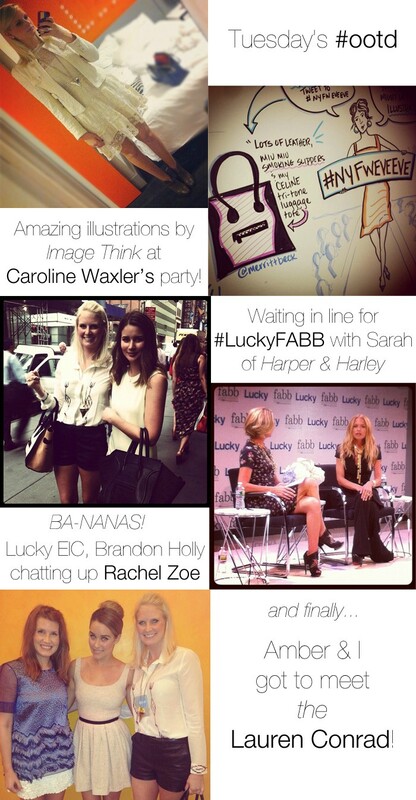 The rewardStyle team has been so busy at both the IFB and LuckyFABB conferences the last two days. Tuesday night after IFB, a few of us went to a private party at past-Lucky Magazine team member Caroline Waxler’s apartment. It was great to meet other fashion insiders and Caroline introduced me to an amazing illustration company that works with social media (perfect for future rewardStyle events)! All you had to do was tweet what you were wearing with the hashtag #NYFWEveEve, and the artist would write your tweet and draw a piece of your outfit! SO cool. Check out Image Think for more info. Yesterday my entire day was spent at the Times building for LuckyFabb. The day was filled with amazing interviews and panels featuring Leandra Medine from Man Repeller, Rachel Zoe and Lauren Conrad (who I got to meet)! Today the rewardStyle ladies are hosting the VIP brunches in various areas of the city and then celebrating Fashion’s Night Out with our favorite bloggers. What are you doing for FNO?